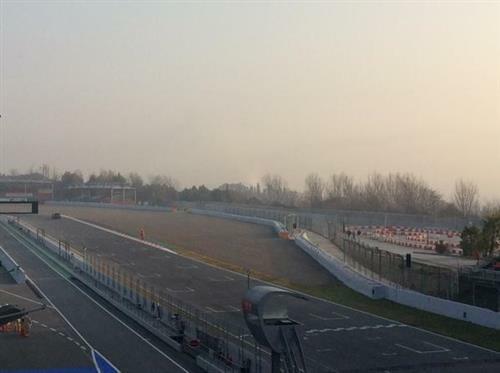 Good morning and welcome to ESPN's coverage of the second day of testing from a rather cool Circuit de Catalunya - the temperature is just 2 degrees Celsius. I even had to scrape ice off my car this morning. Rosberg had been struggling with a trapped neck nerve yesterday but it seems he's recovered well enough to get behind the wheel today. 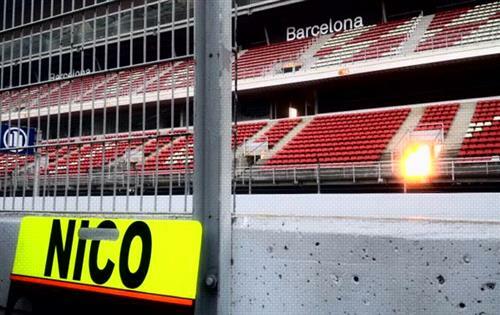 Big question marks about whether we will see a McLaren today. The team's running was limited to just 21 laps because of a broken seal on its MGU-K yesterday - it will not have the necessary replacement until tomorrow, meaning Fernando Alonso might well struggle to accumulate any more mileage today. @Nate are you still saying mercedes are front runners ? @Tungath: Good morning. Mercedes had such a large horsepower advantage last year. We've seen some impressive stuff from Ferrari so far but I don't think Mercedes has been running full beans yet. Yesterday, for example, every run it did was hugely off the pace, suggesting the main focus at this point is high-fuel runs as it looks to solve that reliability problem from last year. Any news on Ferrari's runs, whether they were at higher loads? @Surendhar: Teams don't tend to broadcast how much fuel they run in these tests (for obvious reasons). Ferrari seemed to be doing a good job in slightly longer runs yesterday, but without knowing fuel it's a bit of a guessing game really. That's what testing is - a guessing game. So is there any chance for alonso to come out? Or we will have to wait till tmr? @XanBeX: There's certainly a chance. Any running McLaren can do, it will try and do. But that faulty seal may well continue to be a problem so we'll just have to wait and see. If Räikkönen is leaving Ferrari after the season is over, who's the likely replacement? Would Grosjean be in the equation? @McLaren_Senna: That would all depend on this season. Ferrari have a very able junior driver in Raffaele Marciello but it may not want to thrust him straight into the limelight. I've always thought Hulkenberg would be a logical choice for Ferrari but this is all dependent on Raikkonen leaving - if Ferrari has a good season he may well want to extend his career at Maranello further. I hear some V6 turbos grumbling in the pit-lane to my left. That can only mean one thing - green flag and off we go. Raikkonen and Massa head out to get this test up and running. Lots of activity out on track now as Alonso, Palmer and Rosberg all join the party for initial installation laps. Alonso's McLaren just came past me in the pit-lane with aero sensors on either side, looking more like an X-Wing fighter than an F1 car. Ricciardo's Red Bull the only car not to have completed at least one lap. Looks like Ricciardo has stopped at the end of the pit lane and been wheeled back to the Red Bull garage - briefly prompting a red flag. @Nate What is the purpose of those things attached to Alonso's McLaren? Been wondering about that for some time now. @McLaren_Senna: They help the team measure air flow around the car. 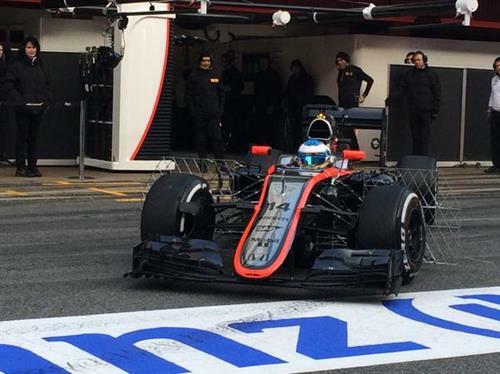 Because of the problems with McLaren's engine aero tests are even more important than they would be otherwise. @NateSaunders So alonso is out. so what exactly does the MGU-k problem affect? Performance? @XanBeX: MGU-K works like an uprated version of KERS, converting kinetic energy generated under braking into electricity (rather than it escaping as heat). It also acts as a motor under acceleration, returning power to the drivetrain from the Energy Store. So it's an engine issue. 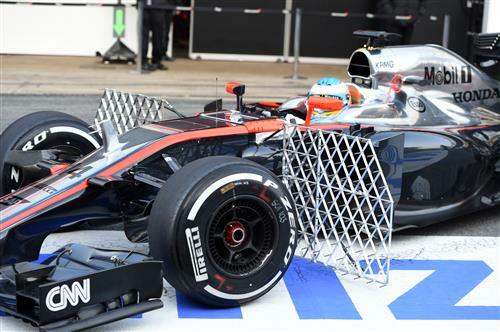 @Nate I bet Alonso gets great TV reception with two TV antenna attached to the car. Good of the team to fit in car entertainment for him. Good Morning, Nate. Think Jolyon will have Pastor looking over his shoulder? I guess it depends on whether the team finds another source of $. @mfbull: Morning. I think Pastor will likely be the last of his worries! Crucial time to impress the team today. 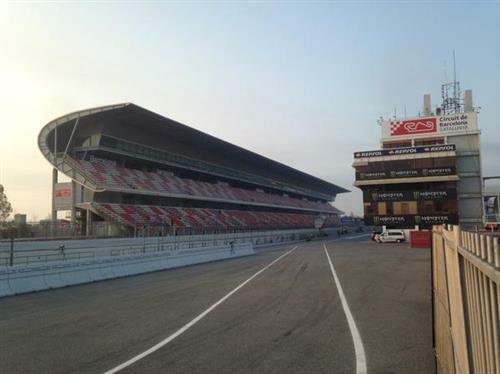 can McLaren make race distance today? @GT: I very much doubt it, given their MGU-K problems. But I've been wrong before so let's see. Alonso completes another few laps and returns to the pits. Still no official times on the board. @XanBeX: Timo Glock missed a race in 2012 - Europe I believe - because of a stomach complaint. We have ourselves a lap time. Ericsson crosses in a 1:36.337 for the first official benchmark of the day but obviously that time will keep tumbling down as the temperature gets warmer. @ND: Indeed we are! We have an exciting new website layout set to launch in April so watch this space. Sorry meant it the other way around, do you think Jolyon will rise to the challenge and be able to pressure Maldonado with his performance? @mfbull: Oh I see. Possibly, but it is quite staggering how much money Maldonado brings to Lotus. Last year Williams were still making money from his PDVSA contract and it was not an insignificant amount of money. @Marais: Yes. Disappointingly it will not look like a black and white zebra.